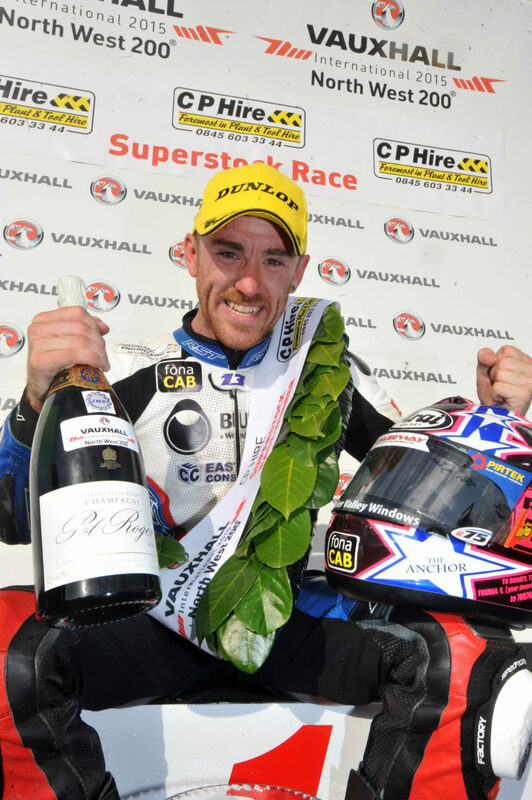 Three times Vauxhall International North West 200 race winner, Lee Johnston won’t be happy with anything less than more victories to add to his NW200 resume from this year’s races. “I want to win races.” the Yorkshire based Fermanagh man declared ahead of this year’s May 13-19 meeting. Johnston has swapped machinery to the Honda Racing team from the East Coast BMW squad for the new season. He will ride a CBR1000RR Fireblade in the Superbike and Superstock races at Portrush and a Padgetts Honda CBR600RR in both Supersport events. The North West 200 will be Johnston’s first race outing with his new team after the squad’s pre-season preparations have been hampered by bad weather. “By now we should have had six days of testing with the bikes but rain has wiped out four of those.” the 29 year old explained. The Honda squad have tested in Spain and have only a final test session at Castle Combe to complete ahead of the North coast event. Many of Johnston’s rivals will have three British championship outings under their belt before North West practice begins. But the 29 year old doesn’t see his lack of setup time on the Honda as a problem. “I don’t see it as a major disadvantage.” Johnston says. Now fully recovered from the injuries he suffered in a TT practice crash at Greeba last June, Johnston also points out he has maintained bike fitness by racing in Australia and New Zealand during the winter months. “I was out there racing when everyone else was eating their Christmas dinner.” he jokes. It is a decade since the 29 year old made his North West debut, winning both Supertwins races in 2014 and taking a Superstock victory twelve months later. Johnston also rode a Jackson Racing Honda to a podium finish in last year’s opening superbike race at Portrush before returning to the East Coast BMW team for the rest of the 2017 season. “I was on the rostrum on a Honda last year and I can’t see any reason why I can’t do it again.” Johnston says. Johnston remains convinced he will be able to mix it up with Alastair Seeley and Glen Irwin at the front of the NW200 superbike pack. “I didn’t do any more testing on the BMW in 2015 than I have this year which was the last time I got some good results and wasn’t injured or sore.” he explained.